The woman believed to be Susan (pictured left in the black hat and grey/silver jacket), was seen to be speaking to another woman (pictured right carrying the umbrella) in Asda in Darwen on Tuesday, January 29. Detectives searching for Susan Wareing, from Darwen, confirmed on Wednesday, March 20, that her disappearance is now being treated as a murder investigation. Could this be Susan Wareing? This image was taken from CCTV at Asda in School Street, Darwen at around 1.40pm on Tuesday, January 29. A 46-year-old man was arrested on suspicion of her murder last week, but has now been released under investigation pending further enquiries. 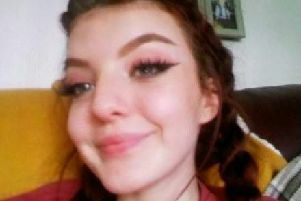 It was initially thought that Susan was last seen on January 30 at around 10pm, leaving a home in Blackburn Road, Darwen. But the last corroborated sighting of her was at a doctor’s surgery on James Street West on the afternoon of Wednesday, January 16. Detectives in Lancashire are continuing to piece together what are believed to be her final movements. Police investigating the disappearance of Darwen woman Susan Waring, 45, believe a woman carrying an umbrella (pictured) might have spoken to her at Asda in Darwen, on January 29. As a result of CCTV enquiries, police are looking into the possibility that Susan might have been at Asda on School Street, Darwen at around 1.40pm on Tuesday, January 29. The woman who detectives believe to be Susan (pictured left in the black hat and grey/silver jacket), has been captured on the supermarket's CCTV speaking to another woman (pictured right and carrying an umbrella). Detectives looking for Susan confirmed on Wednesday, March 20, that her disappearance is now being treated as a murder investigation. There had been previous reported sightings of Susan in the Dumbarton area of Scotland, but detectives have been able to rule them out and do not believe them to be her. Susan is described as being around 5ft 5ins tall, of small build, with brown eyes and collar-length, curly, brown hair. Searches continue to take place at a property in the Blackburn Road area of Darwen.